NC NOW Officer and Lobbyist Robin Davis summarizes the start of the 2017 legislative session for us. She really knows how to break it down! Robin includes Governor Roy Cooper’s Legislative Agenda, the failed attempt to repeal HB 2 during an extra legislative special session, the 2017 election to address the gerrymandered districts, the role and importance of the courts in many of these areas. Robin also talks about what to expect in the long session and our role. Here is a link to the protests known as Moral Mondays. They are currently scheduled from Apr 29 through Jul 6. See the current list at http://www.naacpnc.org/moral_monday_schedule with the dedicated Women’s Rights Moral Monday on June 10. 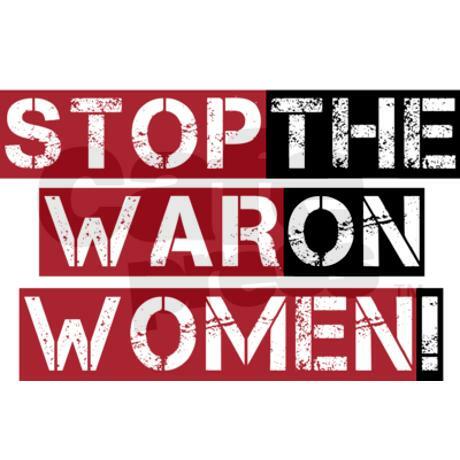 The Women’s Rights Rally is on Wednesday, June 10. Plan to be there, and show the world you care about women’s rights! Organize carpools or a bus from your area! The NC House approved a SEVENTY-TWO HOUR waiting period, up from 24 hours, which was added in 2011 under the so called “Women’s Right To Know” act. This bill does other heinous things. The bill requires that doctors performing abortions on fetuses more than 18 weeks must send the woman’s ultrasound, measurements, etc to DHHS for examination!!! What other medical procedure has anywhere near this level of interference in private medical business!?! 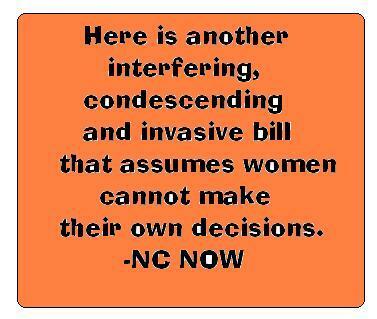 This bill continues to show the current majority of NC lawmakers imposing their will and power over women’s lives. But it should not stand – it is based on heresay, not science or studies or facts, and it is placing un-due burden on women. Many Republican lawmakers stepped out during the debate, and had to be corralled for the vote. They didn’t have the courtesy to listen to the debate. at http://www.wral.com/nc-house-approves-three-day-abortion-waiting-period/14601698/#iDjXZ2b8FV1icGIf.99 also says how hard some lawmakers (all Democrats) tried to rein this craziness in, and also about their very loud ‘NOs’ on the third and final vote (and maybe every vote). The bill was heard in the Health Committee on 4/22/15, and was heard by the full House already on 4/23/15. In the full House, only one opponent of the bill was allowed to speak. House Committee chair Rep. Brian Brown completely ignored doctors and other experts who had prepared speeches. Instead, he repeatedly called for anti-abortion testimony. 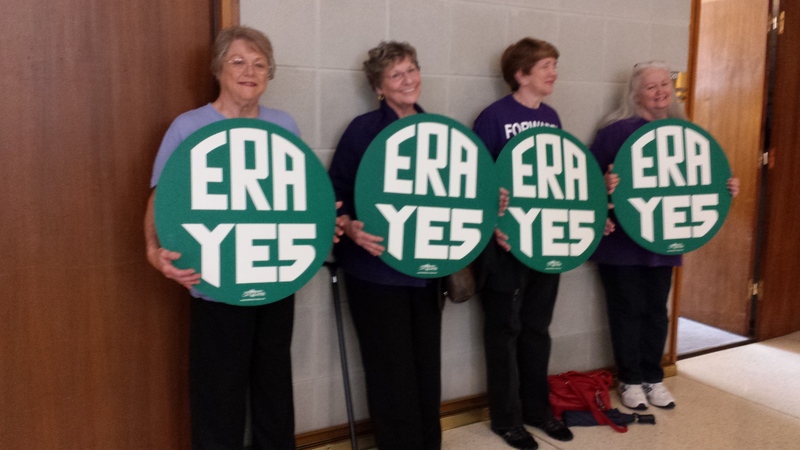 Second Silent Sentinels Vigil at NCGA in the news! Our second silent sentinels vigil at the NCGA made the news already! This second vigil was done in conjunction with Women’s Advocacy Day! Thx, Gary Robertson of the AP, whose article was carried in the Asheville Citizen Times and on WCNC. Thx, Paul Woolverton of the Fayetteville Observer, for coming in to interview some of us! We held our second Silent Sentinels vigil after Women’s Advocacy Day (WAD), April 21, 2015, at 2pm. “Fearless” Carla Cunningham, primary sponsor of this bill, emceed part of the WAD press conference. 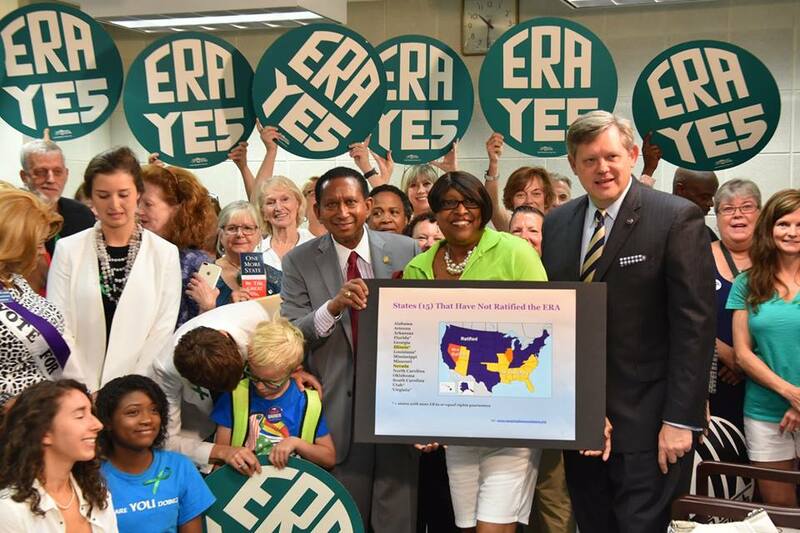 She introduced Robbie Madden, from Ratify ERA NC, to talk about the need for an Equal Rights Amendment. We held this second Silent Sentinels vigil to encourage Judiciary I to move the House ERA bill (H166) along. This time our vigil was in the Legislative Building, in front of office 1013, in front of the Vice Chair of Judiciary I’s office. Last time it was in front of the Chair of Judiciary I’s office. House Bill 847, Amend Laws Re: Medical Treatment of Minors, is a very bad bill. The hard right has repeatedly attacked existing law that guarantees confidential medical treatment for minors for venereal disease, pregnancy, substance abuse, and mental illness. The medical community supports the current law (maintaining minor consent) because there is good reason to believe that in many cases minors would not seek medical help if they knew that their parents would be informed. It is unfortunate when minors feel they cannot confide in their parents, but all caring parents would prefer for their children to obtain the medical help they need instead of having their conditions go untreated. House Bill 847 would require parental consent for minors to be treated for these conditions. The second provision of House Bill 847 would protect parents from charges of neglect or abuse of minor children if they are following medical advice even if the advice they are following is discredited or rejected by the medical community as a whole. It appears that, among other things, this bill would provide cover for parents who subject their minor children to medically discredited therapies to “cure” them of homosexuality and would leave no recourse for concerned family members, health care professionals, or other adults. 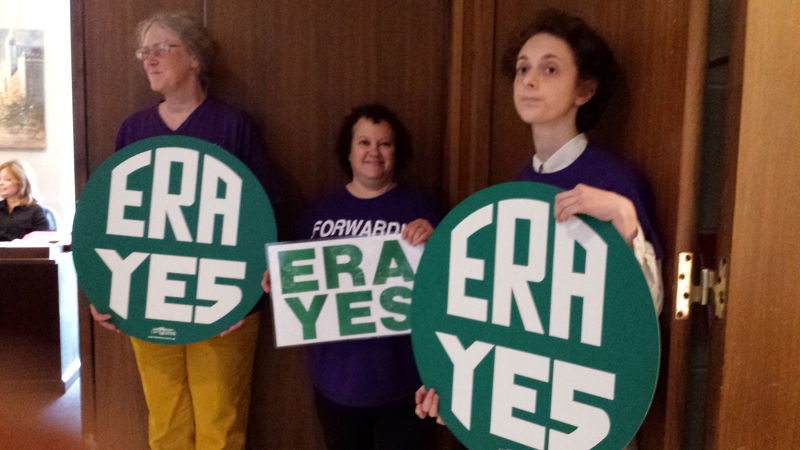 NC4ERA and NC NOW recently held a “Silent Sentinel” Vigil for the Equal Rights Amendment (ERA). The vigil was quite successful in raising awareness. We are expecting coverage of those efforts in upcoming articles by the AP and the Indy Week. We will stand sentinel again this Tuesday, April 21 at 2:00 pm, immediately following Women’s Advocacy Day activities at the NC Legislature, 16 W. Jones St. in Raleigh, NC. The hour long vigil will take place outside Office Rm. 1013 in the Legislative Bldg. This is the office of Rep. Darren Jackson, Vice Chair of Judiciary 1 Committee. The ERA Bill, H166, is sitting in Judiciary 1 Committee. We are advocating that the bill be passed out of committee favorably. Please let us know as soon as you can if you plan on participating.We are expecting media coverage again at this event. Events from later March and also April of 2015. This posting had been waiting to be published for about 3 weeks. Happens sometimes. Thanks to Tara Romano of NCWU for many of the events from many organizations. Sunday, March 8, and Sunday, Mar 29, and Sunday April 19, all in Fayetteville: Fayetteville NOW is co-sponsoring, with Quaker House, the Fayetteville Cumberland Human Relations Council, the Cumberland County Library, a series of 3 “Community Conversations” based on the film “Cracking the Codes.” This documentary portrays many examples and stories that can begin a proactive discussion on the complex issues of race. All are 3pm to 5pm. Follow the link for places and more information. Friday, March 20, Durham: In advance of the Equality NC conference, join the Center for American Progress, Equality NC and others (including NCWU) for an Equality Summit. More info here, including the speakers (many of whom we know). Should be an interesting and engaging event.